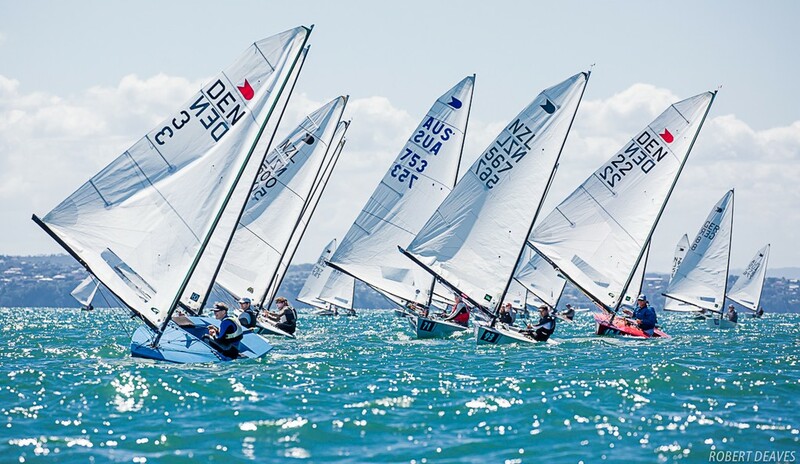 Josh Armit takes the lead after day 2 of the Symonite OK Dinghy Worlds at the Wakatere Boating Club, New Zealand. The young Kiwi posted a 1 and 3 to finish the day tied on four points with Andrew Phillips (3, 15) and Dan Slater (2, 2) after three races and with the first discard taken. Armit won the opening race of the day (R2) ahead of Slater with Phillips in third. In the second race victory went to Britain’s Richard Burton (44, 1) with Slater in second and Armit third. Overall the leading three have a four point advantage over fourth placed Fredrik Loof (10, 4) of Sweden, with Kiwis Luke O’Connell (8, 7) in fifth place, and Steve McDowell (5, 6) sixth. Britain’s Nick Craig had a tough day in the very shifty offshore 10-15 knot breeze, and slips to 14th overall after a 22, 24, scoreline. Race 3 winner Burton is in 24th place overall.